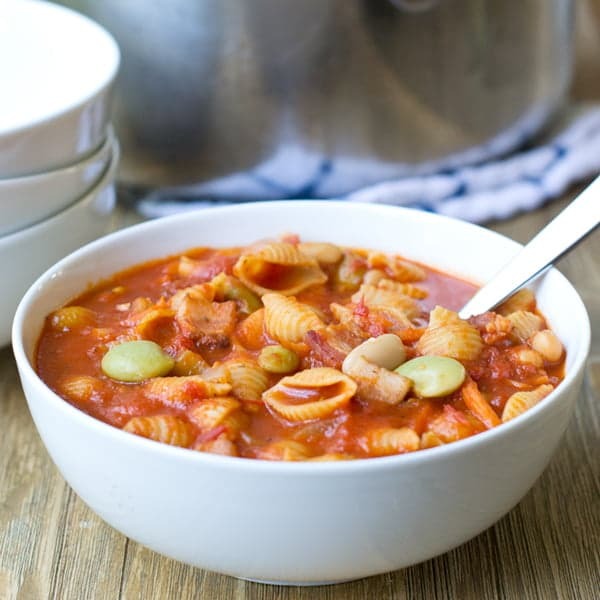 Pasta e Fagioli Soup, like the one they serve at Olive Garden, is delicious and satisfying. Now you can make it in 15 minutes at home for dinner any night. 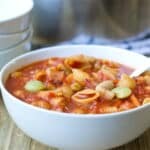 One of my favorite restaurant soups has always been the Pasta e Fagioli at Olive Garden. It’s beans and pasta cooked in a tomato and herb broth. Really hearty and tasty. And those endless bowls with breadsticks and salad? Bring them on! Bowlful after bowlful. I’m there. 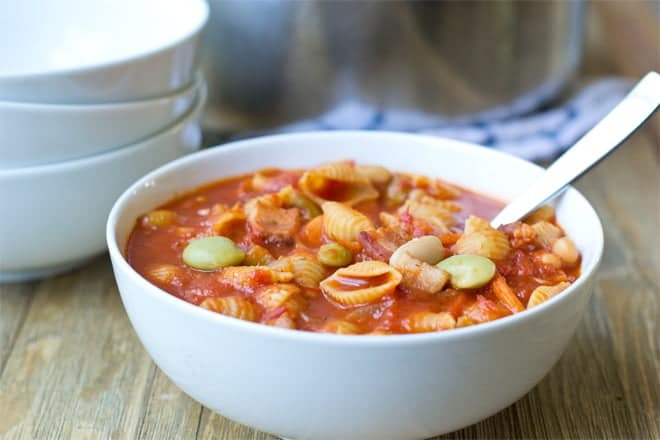 Today’s soup is ready in under 15 minutes so that you can have delicious homemade Pasta e Fagioli Soup whenever the mood strikes you. I’ve done something a little bit different from the Olive Garden with this recipe though. I’ve used frozen lima beans. I like their bright green color and fresh taste. As you may have guessed, the SouperTip for the soup, the thing that makes it so delicious so quickly, is beans. Beans are such a convenient and versatile ingredient. You can get some kinds frozen, like I did for this recipe, or you can use canned beans. Just drain and rinse them and add them to the soup. They don’t need to be cooked, only warmed through. The other thing you can do is use dried beans. You soak them overnight and then cook them according to the package directions. From there, drain them and freeze them. You can add them from the freezer to your soup as conveniently as the canned beans. 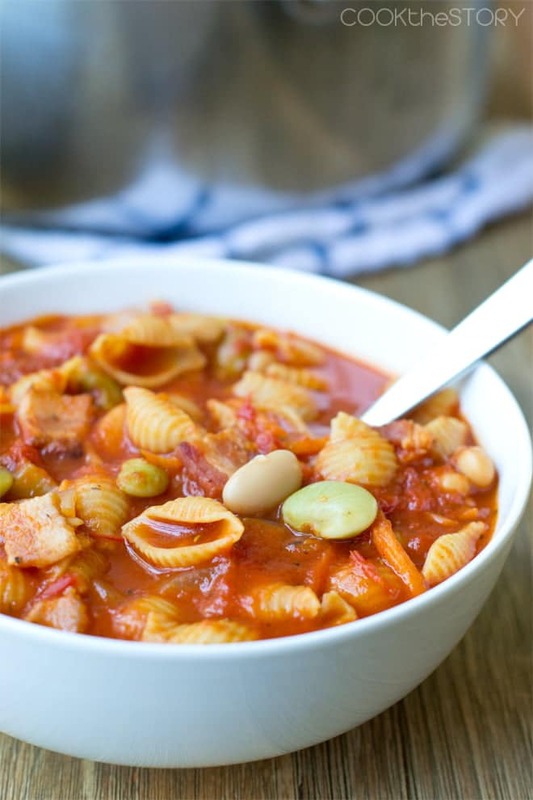 Here’s another soup that makes use of this wonderful ingredient. 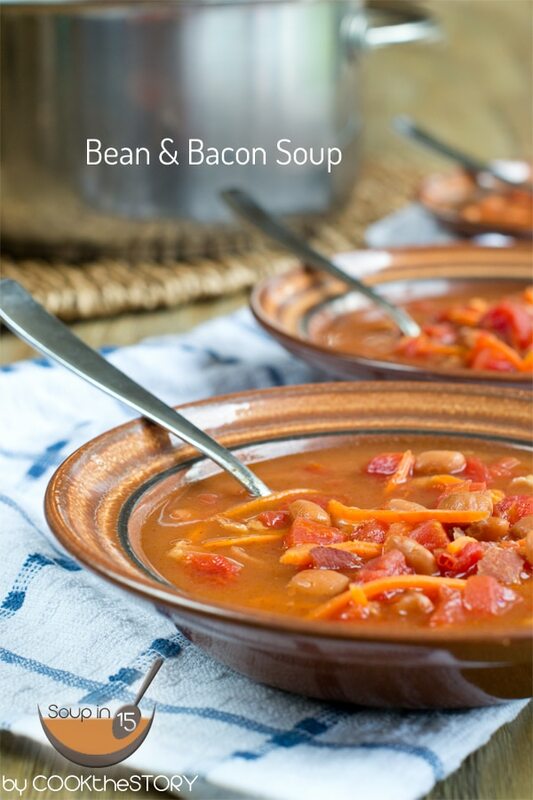 Bean and Bacon soup in 15 minutes. 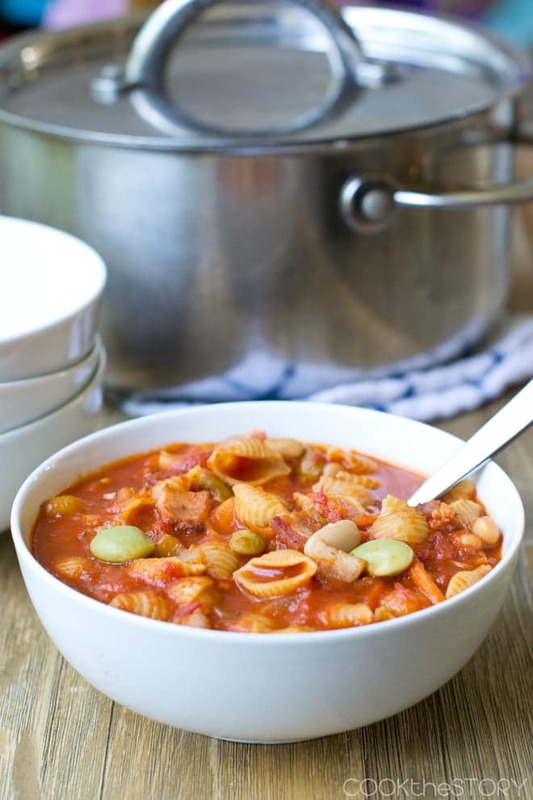 And now here’s the recipe for Pasta e Fagioli Soup. See you in 15! Put the frozen lima beans in a large microwave-safe bowl with the chicken broth. Put in the microwave on high for 7 minutes. Fill a medium saucepan with hot tap water. Cover and put over high heat. When it comes to the boil, add 2 teaspoons of salt and then the mini shells. Cook until they reach the desired doneness and then drain. Meanwhile, put a large pot over medium heat. Roughly chop the bacon and add it to the pot. Roughly chop the carrot matchsticks and add them to the pot. Stir. Finely chop the celery. Add it and stir. Chop the onion. Add it and stir. Mince the garlic clove and add it to the pot along with the thyme, rosemary, red pepper flakes and 1/2 teaspoon of salt. Stir. Add the crushed tomatoes. Drain the cannelini beans and add them. Stir. Increase heat to high. Cover. Add the hot broth and lima beans to the large pot. Stir. Bring to a boil. Reduce to a simmer. Cook until the lima beans are tender. Add the drained pasta to the pot and serve. 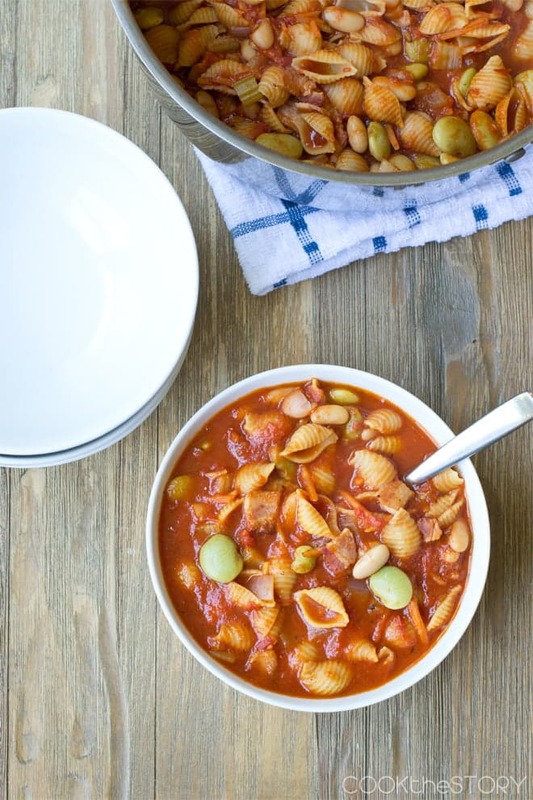 This would be perfect to make my husband for lunch, he loves pasta and soup! One of my all time favorite soups! This one is a great to make on a weeknight, love it! How cool that you can make this in 15 minutes! Looks very comforting!